The reintroduction program for the green turtle in the Cayman Islands is crucial for species recovery. The turtles are threatened by the effects of human overexploitation, according to a study published in the journal Molecular Ecology led by experts Marta Pascual and Carlos Carreras from the Evolutionary Genetics laboratory of the University of Barcelona. This is the first genetic study of the reintroduction project of this endangered species and the wild population of green turtles in the Cayman Islands, a British Overseas Territory. According to the conclusions, the current wild population of green turtle in the Cayman Islands has recovered as a result of the reintroduction process; it presents a high genetic diversity and shows no difficulties regarding breeding. However, the authors of the study recommend conducting genetic monitoring of the species in this Atlantic Ocean region, as it shows a differential genetic heritage compared to other populations of the Caribbean. The green turtle (Chelonia mydas) is a migratory species globally distributed in tropical and subtropical latitudes, which has been exploited by human activity. This species is the biggest one within the family of Cheloniidae—adults can weigh over 200 kg. It represents one of the species of marine turtles with a more natal phylopatric behaviour, returning to its birth place to lay its eggs. Factors such as marine pollution, loss of natural habitat, fishing pressure and bycatches endanger the survival of these turtles, classified as an endangered species according to the International Union for Conservation of Nature (IUCN). During the 1980s, overexploitation of the green turtle in the Cayman Islands caused the disappearance of nesting populations. 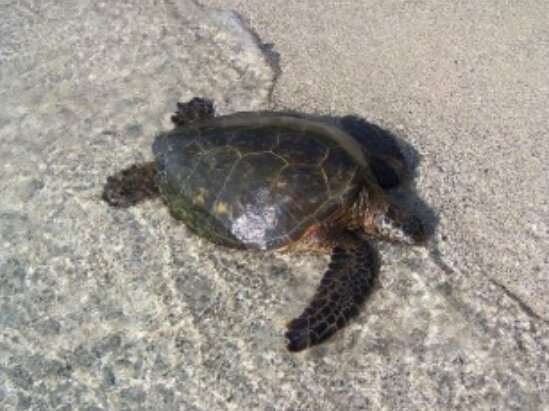 To recover this endangered population, a program of reintroduction of the species was launched with individuals of the Cayman Turtle Farm (CTF). Forty years later, data show that the nesting population of the Cayman Islands has been restored, but researchers did not know if this was the result of the reintroduction process or the natural recovery of the population following the improvement of threatening factors. In the new study, experts analysed several genetic markers to see the degree of parentage of the natural population of the green turtle in the Cayman Islands with the breeding individuals in the farm, and therefore evaluate the effect of the reintroduction process on wild population. "In wildlife, genetic diversity is a key factor that eases the adaptation of populations in the natural environment and their tolerance to environmental changes. In this context, it is crucial to conduct a genetic monitoring of the reintroduction processes to evaluate their success and the potential consequences for the target species of the reintroduction," says Carlos Carreras, member of the Department of Genetics, Microbiology and Statistics of the UB and IRBio. "A threatened population reduces their survival options due excessive inbreeding, but a poorly planned reintroduction can have negative consequences because of the mix of genetically different individuals, since they could create hybrids that are not feasible to the environmental conditions of the population." The population of the wild green turtle has a tight genetic relationship with the specimens in CTF, the new study reveals. Contributor Marta Pascal says, "Ninety percent of the wild individuals were related to the captive stock. This means the reintroduction process was very important in the recovery of threatened populations." The reintroduction process started in the farm with individuals of distant populations, and this explains why the genetic diversity of first generation turtles is higher than their parents." This genetic diversity of the initial population has been changing as a consequence of the captivity process as expected, but also because of the effects of the CTF population management. For instance, they use beings from the same cohort as reproductive adults to replace the losses hurricane Michelle caused in 2001, a strategy that has increased the degree of parentage among reproductive individuals in the farm. Therefore, studies like the one in Molecular Ecology are essential tools to make the right decisions in the management of threatened species. Current labelling studies show that there is a population between 100 and 150 reproductive female adults in the Cayman Islands. In this situation of biodiversity protection, the reintroduction programs for endangered species can become an effective tool of preservation, but can also be inefficient, and can even have negative consequences for the threatened populations and natural ecosystems. "Therefore, it is essential to design these programs of reintroduction of threatened species with scientific rigor and to conduct a long term scientific monitoring to assess its success and the potential consequences for the species," the experts write. The genetic studies carried out by the Evolutionary Genetics team of the UB and IRBio are part of the first scientific initiative to assess the global impact of the reintroduction of the species Chelonia mydas in the Cayman Islands from different sides: social and economic, commercial, and even gastronomic.